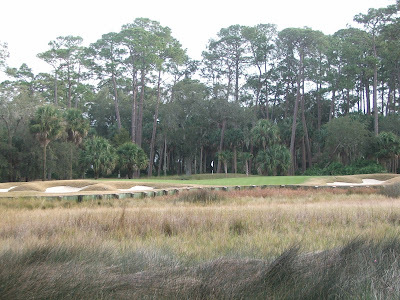 The Ocean Forest golf course (ranked #84 in the world) is located on St. Simons Island in the resort of Sea Island, Georgia. 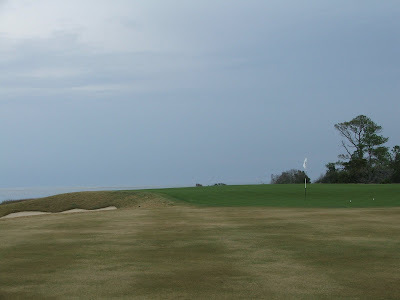 Although Sea Island is a resort, the Ocean Forest course is private and you must play with a member. The course was designed by the Harvard-Yale educated Rees Jones and opened in 1995. It hosted the Walker Cup matches in 2001, the youngest course to do so. Although Rees has modified or renovated many U.S. Open courses, Ocean Forest is his only course ranked among the world's top 100 courses. Ocean Forest is a pretty private affair and most people are even unaware of its existence. To get into the Sea Island resort you have to go through a guard gate, which you can do if you are staying at the resort or playing one of the resort courses. Once inside the Sea Island enclave, to get into Ocean Forest you have to go through a second guard gate as well, after driving several miles down to the tip of the island. This is the only course I have played in all my travels with a double guard gate. The entrance only says 'Private' and there are no signs that say Ocean Forest. To quote Jones, "I learned from Brookline that you don't need extraordinary length if you have small greens. When the targets are smaller, the penalty for missing them is magnified because there is a greater likelihood that they will be missed." 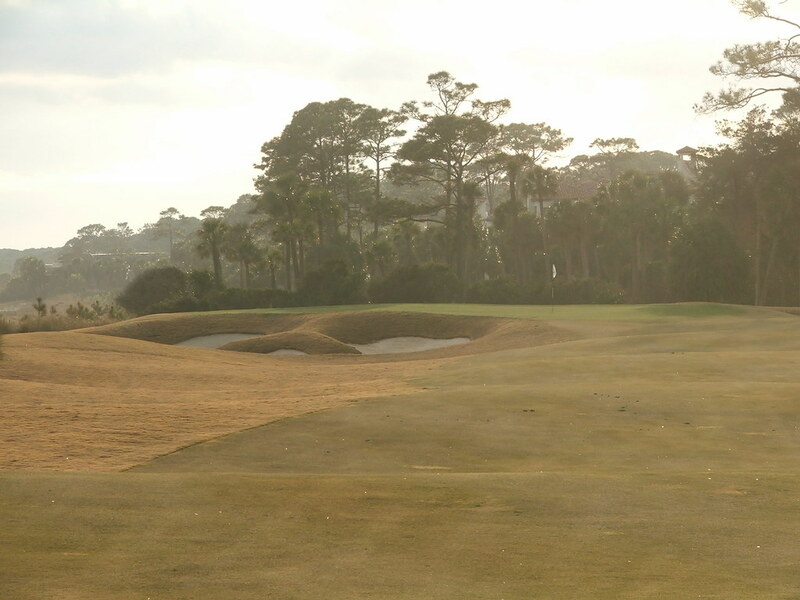 Jones' term for the green designs at Ocean Forest is 'straight back', which means that there are no greenside features to throw wayward shots back toward the hole or stop balls that have been played too long. The greatest dangers at Ocean Forest are behind the greens. What makes the course unique is that it is essentially a links course, but without one of the central features of a links course, which is the ability to bump and run shots up to the green. The way Jones designed the greens, you have to pitch the ball onto them, which requires you to hit the ball high, as opposed to bumping it up. The approaches to most greens are narrow, with bunkers on both sides, making it a demanding course, particularly if the wind is blowing. 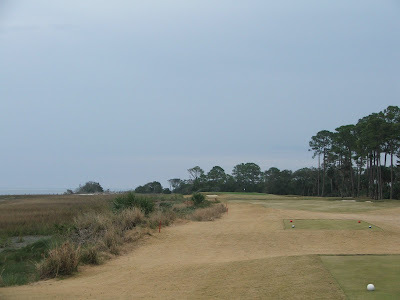 The routing is good at Ocean Forest; Jones had a lot to work with and used it all: the marsh areas, the sand dunes and the areas along both the river and the ocean. The course starts in marsh and wetlands, then you get a brief glimpse of what is to come as the fifth hole backs up to the river with views of the ocean in the distance. While standing on the fifth green, the land you see across the river is all owned by the arrogant, disgraced, bumbling-idiot, Katrina-style bailout leader, ex-Treasury Secretary Henry Paulson, who both owns the private island and had a personal vendetta against Lehman Brothers. Enjoy your ignominious retirement, Hank. You should hope they don't try to bring criminal charges against you for your incompetence. "You're doing a heck of a job, Brownie!" Sorry about the tirade, but it did make me feel better. Through the first five holes, the views of the water are fleeting; you see only enough to build your interest and curiosity because the course is routed inland again after this hole, playing back through the marsh and dunes. The same thing happens again when you get to the 12th and 13th holes; you think you will now play along the water from then on, but the course is again routed back inland before you re-emerge for the brilliant climax of the 17th and 18th holes along the ocean. Jones saved the best for last. 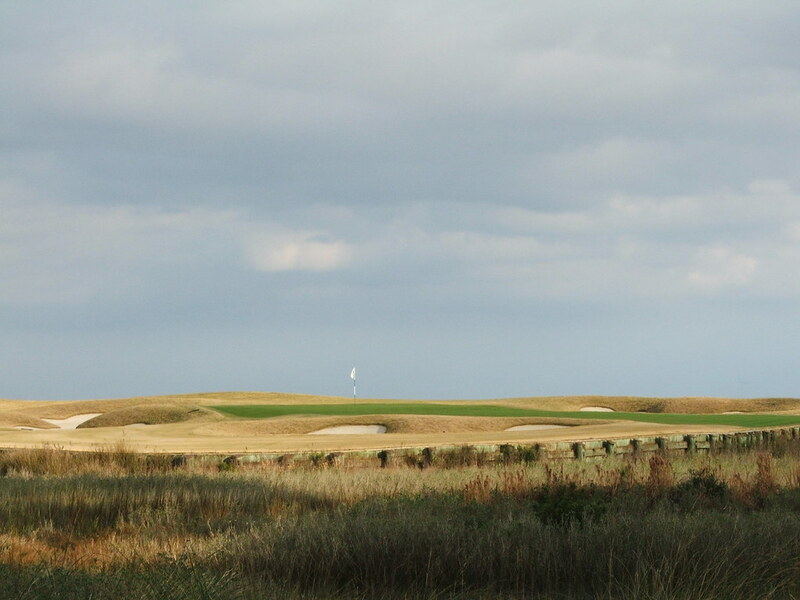 The opening hole on Ocean Forest follows the design philosophy of both Prestwick and the National Golf Links of America, which is of a short, relatively easy hole. Put a big asterisk next to that, however, since this is your first shot of the day and water is in play. At Prestwick, it's the slice over the stone wall and onto the railroad tracks that can ruin your start; at National, a shot into the high fescue; at Ocean Forest, the trouble manifests itself in the form of the 'Mullet Pond' that borders the left side of the fairway. I call it the 'Mullet Pond' because the pond is full of mullet, and they jump high out of the water with a frenetic frequency. When you hit your second shot on the first hole (and your tee shot off the 9th hole), you will absolutely be distracted by the jumping mullet. The second hole plays along a stand of trees, the third plays by the dunes and the fourth plays by the wetlands. The ninth hole, a 151 yard par three has a Biarritz feature in the front, the jumping mullet, and an occasional crocodile sitting nearby the pond. It's a nice short par three that requires a precise tee shot over water and offers no bailout option. The 10th hole was my favorite on the course. Jones calls ten "the most thought provoking, risk-laden hole." The tee shot on this 545 yard par five demands a shot hit to a fairway which is set at an angle, over marsh grasses. It is a classic risk-reward shot. The further to the right you can successfully hit, the closer to the green you are. A shot hit short of the fairway is gone. There is a beautiful marsh along the entire right side of the hole. The green is treacherous, well protected by bunkers and has a lateral hazard on the right and to the rear. The 13th, a 381 yard par four, plays along the Hampton River and has a stream running through the fairway, which means most players have to club down off the tee in order to avoid hitting into the hazard. Fifteen is a short par three at 165 yards. My advice is take one more club on your tee shot. It plays longer, even though it is set on level ground; you have to hit it the entire way there over marsh grasses with a cross-wind blowing across the green. The 16th hole is quite good. 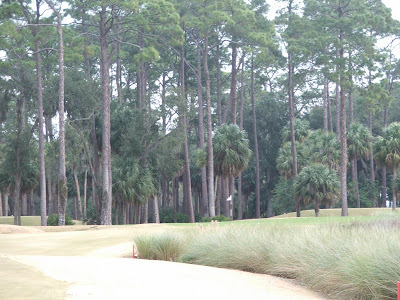 It plays 425 yards from the back tees and is a dog-leg left where you have to hit through a chute of trees. The hole requires you to shape your shot off the tee and land on the left side of the fairway. The book The World's 500 Greatest Golf Holes ranks this hole as one of the hardest in the world to get on in regulation. Part of their logic is that there is usually a fresh breeze blowing across the marsh near the green, and the green repels balls. Behind the green, there is no margin for error because there is a shaved area that trickles down into a lateral hazard. I'm a hack and got there in two, so I'm not sure about their assessment. The first time the course has a hole bordering the Atlantic Ocean is on the long 217 yard par three seventeenth. The seventeenth green backs up to the ocean and is wind-swept, with winds blowing across the marsh nearby. Believe it or not, there are only a handful of holes on courses ranked in the top 100 in the United States that play along the Atlantic Ocean. Seminole sorta-kinda has a couple of holes. 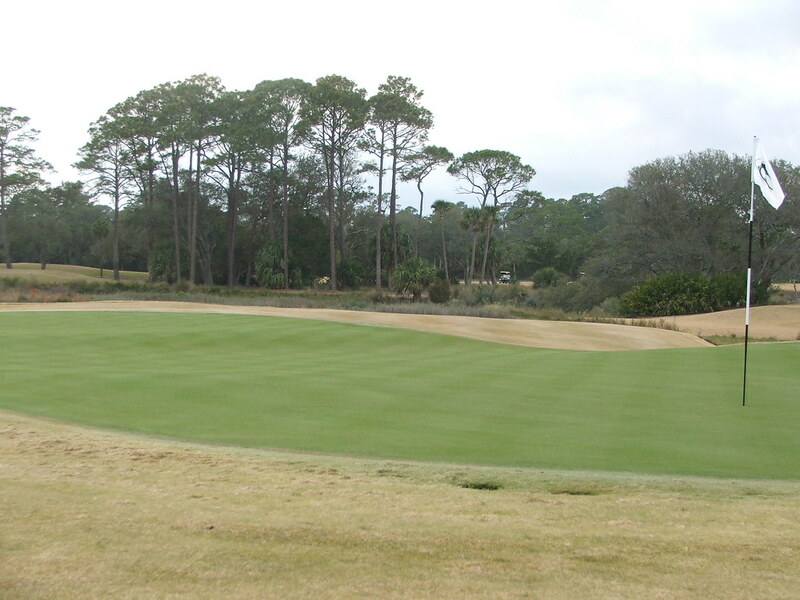 Maidstone has two or three, The Ocean Course at Kiawah has several and these final two at Ocean Forest. The eighteenth hole is 480 yards, plays along the Atlantic from tee to green, and is a tough finishing hole with a small green that slopes back to front and is well bunkered. The locker room at Ocean Forest is among the best I have seen. It is on a par with Seminole, San Francisco and Mayacama. The locker room has its own library; a nook with a giant fireplace and card table; a cozy seating among the lockers, and the top of the room is adorned with animal heads. Ocean Forest reminded me of another exclusive southern club, The Honors Course. Both encourage walking, have great caddy programs, have a great respect for the traditions of the game, particularly amateur golf, and both exhibit true Southern hospitality. Walter Hagen once said he didn't want to be a millionaire, he just wanted to live like one. Staying at Sea Island will allow you to fulfull Walter's fantasy. It's expensive, but it is a true five star resort and worth it. The Seaside course, also located at Sea Island, a few miles from Ocean Forest is not ranked in the top 100 courses in the world, but does rank as one of the top public courses in the country. Personally, I think it is a better course than Ocean Forest and I will do a detailed write-up of the Seaside course next. It is also the easiest way for most people to see the design work of the genius architects H.S. Colt and C.H. Alison, and in particular their unparalleled ability to route a course. Those that followed my travels to Japan know how highly regarded Charles Alison's design skills are. His partner, H.S. Colt, was involved in Royal Portrush and Pine Valley. Playing the Seaside course is a good chance to see how great this pair were without traveling half-way around the world or without gaining access to a private club. Why is Ocean Forest ranked so high in the world? A little inside-baseball might provide some insight. Gary Galyean, who wrote the club history after the Walker Cup matches in 2001, also serves as chairman of Golf Magazine's top 100 courses jury. 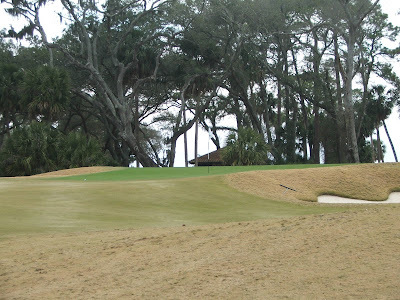 Rees Jones also rates courses for the magazine as does the owner of Sea Island, Bill Jones III. It can't hurt to have three people associated with the course on the rating panel. As we say in Brooklyn, "You know what I mean?" Ultimately, Ocean Forest is like local boy Davis Love III. All the essential elements of greatness are there, but there is just something I can't put my finger on that keeps me from becoming a big fan. There are four courses ranked on the world top 100 in the state of Georgia. I have now finished playing three: East Lake, Peachtree and Ocean Forest. You all know which one I still need. Not sure I've ever posted here but I subscribe to your blog, have heard you on the Smarter Golf podcast and thoroughly enjoy living vicariously through your experiences. These niche blogs and sharing that wasn't possible only a few years ago, is what makes the web a wonderful place. lol on Davis Love III. I feel exactly the same way, just not a guy that's easy to root for. After a recent jaunt to paradise (a.k.a. 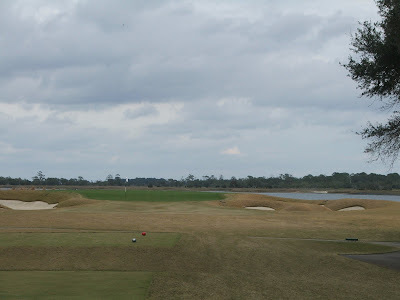 the "low country" of Northeast Florida and Georgia) that included play at Frederica and Ocean Forest, I can say that they both lived up to their billing. 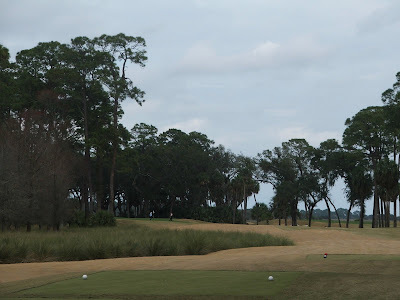 People always make the places you visit and the staffs assembled by Golf Professional's Andrew Shuck at Ocean Forest and Steve Archer at Frederica are exceptional. As a visitor I was made to feel so much at home that my experience was greatly enhanced by their genuine southern hospitality. I agree wholeheartedly of the "Seminole like" reference of the O.F. locker room (it is fabulous), however I find objection with your discourse regarding the links. In establishing an opinion of the course, it is important to note that virtually no earth was moved in construction. 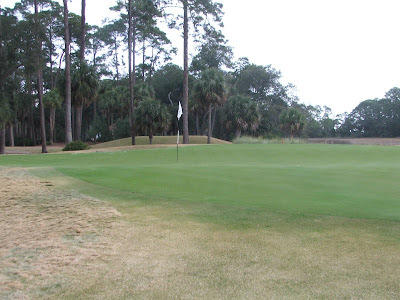 The rolly polly feel of 2nd and 3rd fairways are completely natural and the exposed outcroppings of land that provide splendid vistas of the sea have been there since Fort Frederica (hence the name of nearby Frederica Golf Club)was the British military headquarters in colonial America. Through personal experiences, I have also found Davis Love III to be a fine southern gentlemen that represents the game and his family name in a humble and gracious manner...sports needs more DL III's and less showboating. Wishing these two great clubs all the best! I had the pleasure of playing Ocean Forest last week and it was a pleasure. However, I understand its owner Smith is on the voting committee and that explains its 87 in world ranking. I'm a South Carlina boy and I've played a lot of golf. 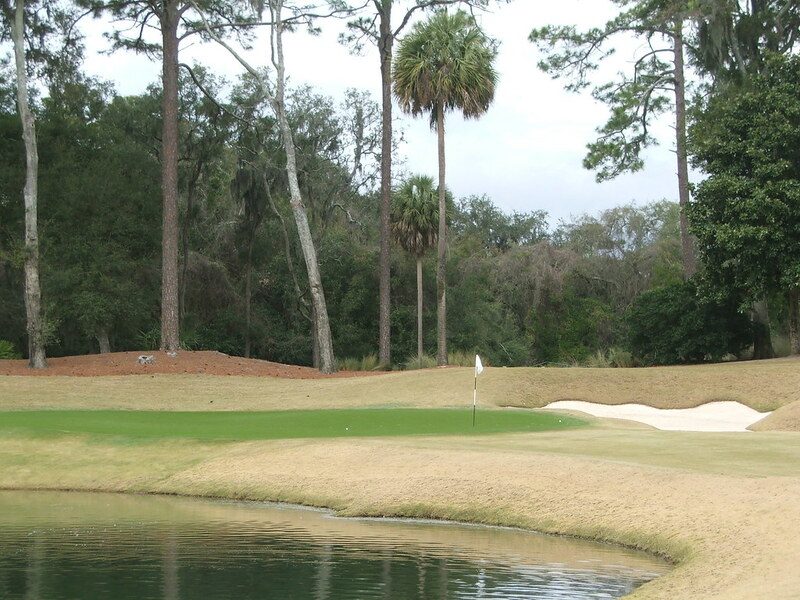 Here are the Top 10 golf courses in the South, agree or disagree? Not a bad ranking, although I rank Yeamans Hall ahead of the Honors Course. How would you rank the top 10? Do you have any over weight, Republican friends?